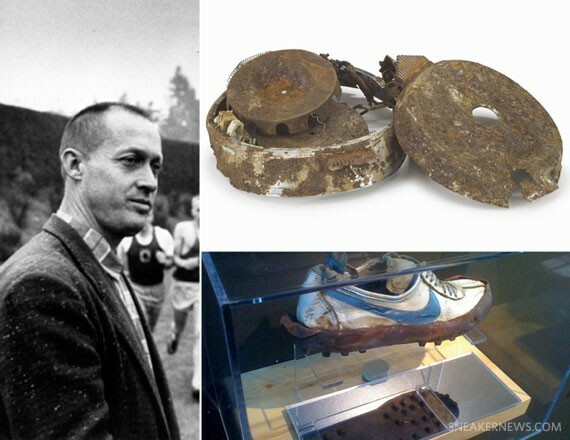 The first modern training shoe was the Nike Waffle Trainer, developed by Bill Bowerman. Bowerman was the head coach of the Oregon Ducks in the 70s, and wanted to make his runners shoes. The story goes that he made his shoes with the family waffle iron, thus earning the name Nike Waffle Trainer. Before his revolutionary shoes were created, athletes would use what are known as minimalist shoes. Shoes with nothing to them other than a thin layer of leather to protect their feet from the elements. This idea of natural running has begun to make a comeback in the runner's world. Advocates for the minimalist running argue that running barefoot strengthens feet and reduces the risks for injuries like IT band syndrome, runner's knee, shinsplints and many other running related injuries. While others would say that we have come too dependent on the modern running shoe to cushion our strides to go back to barefoot running, that our feet and become too adapted to shoes to take the padding away all together. However, if you slowly bring barefoot running into your training routine, the benefits of the natural run will outweigh the few problems you may have when running barefoot. Over 75 percent of all American runner's heel strike, sending collision force of about 1,000 times per mile to their whole lower leg. Every runner has been told that the most efficient and pain-free way to run is by landing on the ball of the foot or the middle of the foot. With the typical running shoe though, runners almost always land heel first, because the cushion in the heel prevents them from getting their toes down first. Studies have found that barefoot runners tend not to heel strike like shoe runners do. Heel striking is much more painful for barefoot runners than those with shoes, which is probably why the natural runners will unconsciously correct their running form. "By landing on the middle or front of the foot, barefoot runners have almost no impact collision, much less than most shoe runners generate when they heel strike. Most people today think barefoot running is dangerous and hurts, but actually you can run barefoot on the world's hardest surfaces without the slightest discomfort and pain. All you need is a few calluses to avoid roughing up the skin of the foot. Further, it might be less injurious than the way some people run in shoes" says Daniel Lieberman, professor of human evolutionary biology at Harvard University. Every runner in the world just wants to know one thing, how they can become a faster, stronger runner. How can they hit that next PR in a 5k, half marathon, or even a marathon. Well, minimalist running could be the answer. When racing, you want to have as many foot strikes to the ground as possible, with minimal air time in-between. When your feet off the ground, you aren't going forward, so the sooner your feet are hitting the ground and pushing you towards that finish line, the better. Shorter and more frequent strides are the key to great racing. Studies are now finding that barefoot runners are having shorter stride length and greater frequency. Tom Kelso in Breaking Muscle wrote that "A study by Squadrone and Gallozzi discovered these facts: Ground contact time (in seconds) during barefoot running was significantly shorter than shod running (0.245 vs. 0.255). Stride length (in meters) was significantly lower when barefoot running (2.19 vs. 2.34). Stride frequency (in strides/minute) was significantly higher while barefoot (91.2 vs. 86.0)." There have been elite athletes who have been barefoot runners, like Bruce Tulloh. He broke European record times from 1955 to 1967, nearly all in bare feet. He ran a 13:12 three mile on the grass barefoot, and 27:23 for a six miler on cinders. Even today, there is the Tarahumara Indians from Mexico, who have been running barefoot for generations. While the barefoot running is definitely becoming popular, there are still many skeptics. When you first start going barefoot or using a minimal shoe, it can be a shock to your feet, and require a slow transition into going completely barefoot. This isn't the only worry that people have about natural running. Running in shoes give more protection from rocks, nails, glass, and anything else that happens to be on the ground. They keep your feet insulated during cold weather, preventing frost bite in the winter runs. Also, many runners feel that if they don't have any issues now, then why change? If they have don't have any sort of injuries or pains, why take the chance on anything happening? If you take into consideration all the benefits that you get from minimalist running, why not try it. It corrects your running form, which will also help prevent injuries. Barefoot running gives you shorter, faster strides, making you a more efficient athlete. It will strengthen your muscles, tendons, and ligaments of the foot and give a runner a more developed natural gait. Also, when you remove the lift that is in the heel of most shoes, it will help to stretch and strengthen the Achilles tendon and calf muscle which can help to reduce chances of calf strains or Achilles tendinitis. Now you don't have to completely give up shoes all together and run barefoot through the snow. Simply doing a short run every week in minimal shoes like the Nike Flys can greatly improve your running form or help you better prevent your injuries. So, if you are a serious runner, who wants to make the most out of their runs, who wants to be the greatest athlete their body could possibly allow them to be, then adding in some natural running to your routine could help you reach those goals. Douglas, Scott. "What Happens When You First Run Barefoot." Runner's World & Running Times. N.p., 7 May 2013. Web. 08 Feb. 2014. "Barefoot Running." Runner's World & Running Times. N.p., n.d. Web. 07 Feb. 2014. Randsell, Eric. "The Nike Story? Just Tell It! | Fast Company | Business + Innovation." Fast Company. N.p., n.d. Web. 08 Feb. 2014. Kelso, Tom. 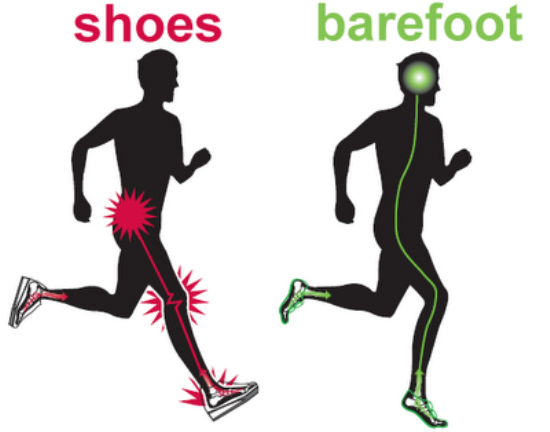 "The Pros and Cons of Barefoot Running: What the Research Says." Breaking Muscle. N.p., n.d. Web. 08 Feb. 2014. Harvard, University. "Barefoot Running: How Humans Ran Comfortably and Safely before the Invention of Shoes." ScienceDaily. ScienceDaily, 1 Feb. 2010. Web. 08 Feb. 2014.